Vernon, British Columbia--(Newsfile Corp. - June 7, 2018) - True Leaf Medicine International Ltd. ("True Leaf") (CSE: MJ) (FSE: TLA) (OTCQB: TRLFF), a plant-focused wellness brand for people and their pets, is pleased to report the construction of its cannabis cultivation facility, True Leaf Campus, being built in Lumby, British Columbia, is on schedule for completionin fall 2018. The first phase of the project includes a 16,000 square foot cannabis cultivation and production facility with over 9,000 square feet for the initial grow area, laboratory services, whole-plant extraction, and the production of therapeutic cannabis products. 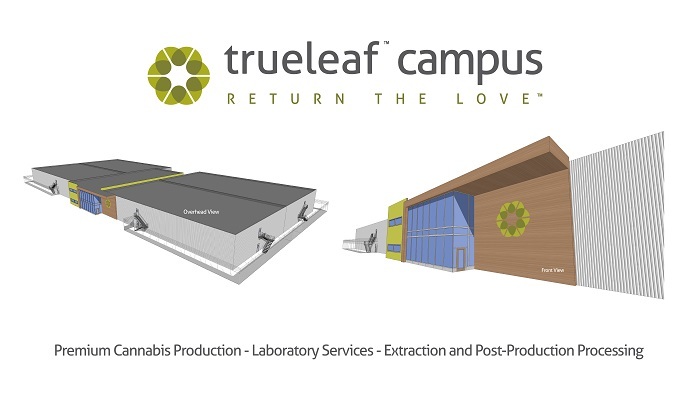 The facilities, known as True Leaf Campus, will be a hub for the development of the company´s medicinal cannabis products. The steel arrived and was pre-assembled on site, and the building permit was approved on May 30, 2018. With the crew now erecting the structural steel, the exterior foundation insulation is complete and the backfill compaction testing performed — passing well above requirements. The interior backfill for the administration building is complete. Crews have also installed the rebar for the production building and are now completing formwork. True Leaf has retained Colliers Project Leaders to provide professional project management services and a value engineering review to keep the project on time and on budget. "This is an exceptionally well-managed project," said Darcy Bomford, Founder and Chief Executive Officer of True Leaf. "Our design-build firm, SBL Contractors Ltd., and Colliers Project Leaders have kept construction moving forward within budget and on schedule. This means True Leaf is getting closer to its inspection by Health Canada and nearing the final milestone of receiving our license to produce cannabis." The facility is being built on a 40-acre site owned by True Leaf, so the company is well-positioned to expand to meet future market demands. True Leaf is a plant-focused wellness brand for people and their pets. Founded in 2013, True Leaf has two main operating divisions: True Leaf Medicine Inc. and True Leaf Pet Inc. The company´s goal is to provide federally-approved medicinal cannabis products that will be sold across Canada and the United States. True Leaf Medicine Inc. was launched in July 2013 to become a licensed producer of medicinal cannabis for the Canadian market. True Leaf Medicine Inc. has been granted approval by Health Canada to build its grow facility and will be subject to a Health Canada inspection upon completion to allow for the cultivation, manufacture, and distribution of cannabis products. Currently, True Leaf does not have a license to produce cannabis.